Android Gmail users can rejoice. Starting today, the team began rolling out Gmail 5.10 for Android. This release includes the long awaited Rich Text Formatting feature similarly found on the web interface. 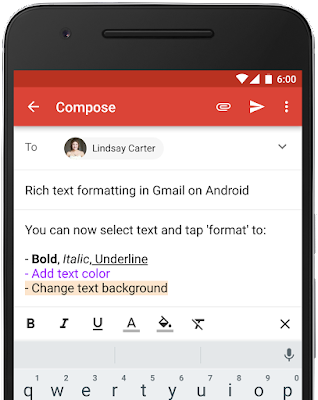 What this means is users can format the emails on Android including Bold, Color, font size, and much, much more. Just highlight the text you want to format, long press on it to bring up what used to be the Cut/Copy/Paste menu and you will now see a new menu choice, Format. Tap on the format option and the formatting tool bar will appear. Once you have the toolbar, have fun formatting your mobile emails.